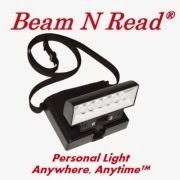 I received two free Beam N Read lights in exchange for my fair and honest review. My Review:I have a long and storied history with book lights. Ever since I was a kid I would, like any good Reading For Sanity reviewer would do, I read books late into the night, sometimes much to my parents’ chagrin. I did have a big light attached to my top bunk bed that I could use, but once that light was supposed to be out, I couldn’t very well turn it back on. I did try a variety of book lights over the years (and I mean like many, many years.) The first ones were, of course, not great .They didn’t give off a lot of light. The one I’ve like the most over the years is one my sister gave me for Christmas about ten years ago that turns on when you open it up. The problem with all these book lights, however, is that they have to attach to a book. Now, I don’t know about you, but I think that’s annoying because every time you turn the page, you have to move the book light, and sometimes there just isn’t time for that kind of thing. Also, they don’t always attach to every book the same way. The clips often aren’t big enough (because apparently no one reads hardbound books except me? I think not) and so what I used my light mostly for was when I was traveling in the car or in the airplane, and then I would just hold it in my hand, kind of finagling the book and the light around and making do because the sacrifice was worth it. Cue the Beam n Read Light. This is actually a cool little light. First off, it’s worn around your neck, which is convenient and hands-free. The strap is adjustable, of course, so you can decide how close you like your light. I had two different sizes to try—one with six lights and one with three, although the six light model does allow you to only use the three lights, which I actually preferred for reading. It also has different light filters—a red and an orange, which according to the manufacturer, studies have shown are more conducive for sleep after reading as opposed to the normal glow of a handheld device or computer. I did try the different light filters, and although they didn’t hurt my eyes and worked fine for reading, I’m old fashioned and just preferred the normal light without the colored filters. Because it is worn around the neck you do have to figure out how to use it in bed, but since I’m determined (and because it was really easy) that was really easy to figure out. It’s nice because the light can be positioned in different ways so it was easy enough to find somewhere to balance it and just read on and on, turning pages with nary a worry. It’s sturdy, too, without fussiness or confusion. It makes reading in the car really easy, too. As a driver, no matter how well-positioned the lights, I think it’s hard to see with the normal overhead reading lights on. This little light is cool because it focuses right where you need it to without the weird balancing act of holding a light in your hand, plus it doesn’t bother the driver. But the real test came when we had a power outage. Normally our power outages only last for a few minutes, but there was some construction going on in our neighborhood and they hit a power line. The power was out for six hours, some of it going into the night. Usually we use headlamps for all of our tasks—getting dinner ready, changing diapers, cleaning up, etc., but anyone who’s ever used a headlamp knows that the one wearing a headlamp is not your friend when they look up at you and you are temporarily blinded. Not so with the Beam n Read Light. This little gadget—especially with the six lights on—gives off quite a bit of light and makes it easy to get tasks none minus the blinding of the other power outage comrades. We really liked it. My husband wore the bigger one and I wore the smaller one and between the two of us we got pretty much everything done. It’s definitely nice that the light is just always there unlike a headlight where if you look away for one second you’ve lost what you were focused on and the light is completely gone. It’s much more convenient to have a light follow your body than your head. Also, most head lamps’ batteries don’t last very long over the long term. If they sit for too long unused (like in a food storage situation) they won’t work. I’ve also taken head lamps camping and I feel like the Beam n Read Light would be a great alternative to this, especially when preparing food in the evening because it’s hard to position your head lamp low enough to see what you’re cutting without sporting an awkward neck angle. I’m definitely recommending this light for both the book lover in your home (stocking stuffer, anyone?) and also for someone who is into emergency preparedness or camping. The long life of the batteries, the brightness of the light, and convenience of being able to wear it around your neck all make it ideal for not only reading but for times without power, which from personal experience, I can attest was a time I was very happy to have it.